Product prices and availability are accurate as of 2019-04-22 00:51:18 UTC and are subject to change. Any price and availability information displayed on http://www.amazon.com/ at the time of purchase will apply to the purchase of this product. 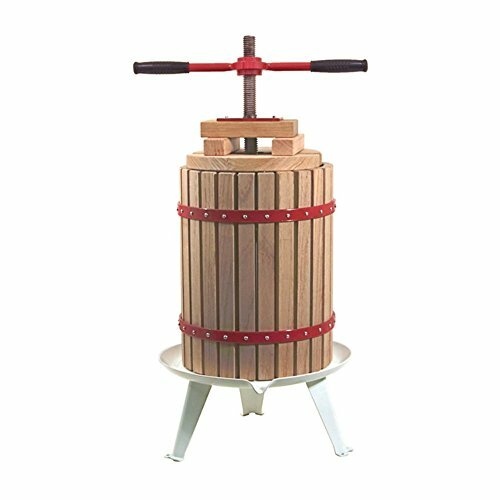 The TSM Harvest Fruit and Wine Press turns an Old-World process into a modern DIY tradition, allowing the novice or experienced fruit presser to affordably create homemade wine, juice, and/or cider for family and friends. With its 4.7-gallon capacity, solid oak wood construction, and heavy-duty cast iron handle, this press brings the best of modern technology to an age-old experience. Solid U.S. oak wood basket. Double cast-iron handle with rubber grips. Powder-coated steel frame and base. Instruction manual included. 18L (4.7 gallon/19 quart) capacity.